Jawas are diminutive humanoids from the rim world of Tatooine, often described as "rodent-like", and speaking in a randomly variable language that is very difficult for outsiders to decipher, when they want it to be so. Little is known of their physiology, but they are believed to be natives of Tatooine, along with the larger "Sand People" (also known as Tusken Raiders). Some xenologists have theorized that Jawas have human origins. 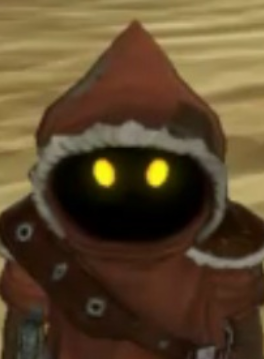 The normal body temperature of a Jawa is 116 degrees, and the only feature usually seen of a Jawa is a pair of glowing amber eyes peeking out from under its cowl. They are best known as scavengers of the desert, traveling in huge, lumbering machines known as sand crawlers, legacies of an earlier era when Tatooine was home to massive mining operations -- When the corporate mining operations closed, the tracked mining/processing vehicles were left behind, and claimed by the local scavengers. Now, the sand-crawlers have become an integral part of Jawa culture, as entire clans live within the machines, which have been converted over into mobile living quarters, workshops, and storage for supplies and interesting things they find in the desert -- often courtesy of crashed spaceships, or ancient refuse. 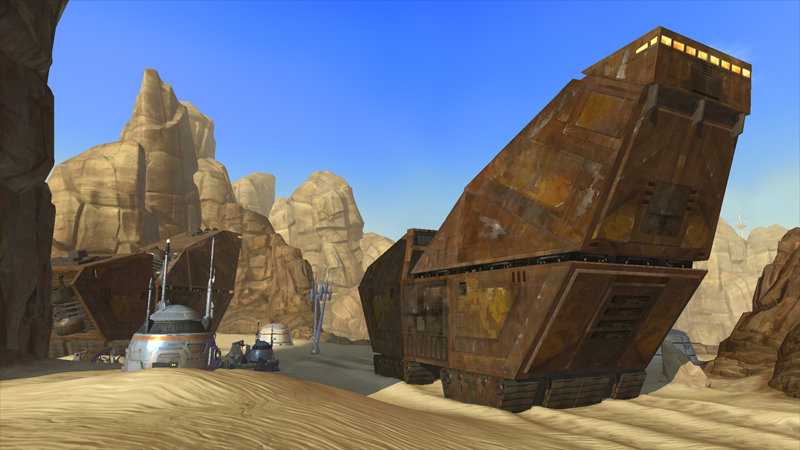 The sand-crawlers provide some protection against the violent Tusken Raiders, the massive Krayt Dragons, and the elements. Although Jawa culture may have been entirely different, once upon a time, they now mostly make their living scavenging discarded items of technology (such as droids), repairing them (to varying degrees of success), and then selling them to Tatooine's inhabitants. Traditional Jawas do not bathe (water, after all, is in scant supply, and requires energy to recycle) and tend to be seen as pests or a "necessary evil" to those who do any dealings with them. Personality: The stereotypical Jawa is one part scavenger, one part tinker, and one part used droid salesman. Within a given clan, any given Jawa will tend toward his or her own particular specialties, but to outsiders, it's hard to tell any of them apart. Jawas are not especially aggressive, and given their small stature compared to many species, they tend to be fairly eager to avoid physical confrontation. Given their tendency toward scavenging, many are not above outright theft, so long as it does not bring retribution upon one's clan. Physical Description: Short humanoid with glowing amber eyes, invariably attired in a dark brown hooded robe of coarse material, boots or leg-wraps, gloves, and facial wrapping akin to that of the Tusken Raiders. What lies beneath a Jawa's wrappings, no one knows (and no one has been particularly inclined to find out). A Jawa adult stands between 1.0 to 1.3 meters tall. Language: Jawan and Basic. It is common for Jawas to learn other languages, but as is a common conceit among many species, even if they understand Basic, they prefer to speak in their own tongue, assuming that the listener understands Jawa, or there is an interpreter present.